Is PGS an Obvious Win? PGS offers a number of benefits, which some critics may contest, and we’ll cover each of those in this lesson. First, when PGS is used fewer embryos are transferred that lead to either a failed implantation or a miscarriage. Failed transfers exact an emotional, financial and temporal toll. Below is data from one clinic that shows when they transfer PGS-approved embryos, they have higher rates of implantation and those implanted embryos are less likely to result in miscarriage. RMA New Jersey has noticed a phenomenon that we’ve now seen repeated throughout the US: when patients use PGS they are more amenable to transferring a single embryo, because they have higher confidence that embryo will lead to a live birth, as you can see below. This matters because multiple embryo transfer carries meaningful risk (as we cover in our Embryo Transfer Course). When a single embryo is transferred only 1% of births result in twins but when multiple embryos are transferred 27% of births result in twins. Carrying, and delivering, multiple babies is dangerous. Complications during delivery to mother and child increase substantially (2 – 5x) with multiple gestation births. These observations are culled from an enormous dataset: every U.S. delivery between 1995 and 2000. We should say here it's possible to have higher rates of risk and yet still low probabilities a bad outcome will occur. That said, multiple fetuses leads to premature-birth, and low-birth weight, in 57% of cases for twins and 97% of cases for triplets. Why does this matter? Low-birth weight and premature offspring record lower cognitive scores equating to tens of points on the I.Q. test. In the last month of gestation alone the baby increases it’s cortical grey matter by 50% and myelinated white matter threefold. The authors in the above study also determined, when looking at similar studies, there was a clear correlation with low birth weight, short gestational period, and attention deficit disorder. Many fertility patients are not just hoping to have one child, but to build an entire family through IVF. That may be possible from a single retrieval retrieval given most patients who get one embryo from a retrieval actually get multiple. Now, let’s imagine two scenarios (follow the diagram below) for a family that had their retrieval in January, 2018, and had one viable embryo that could lead to a baby, and extra embryos that were all aneuploid, but they know they want more children. 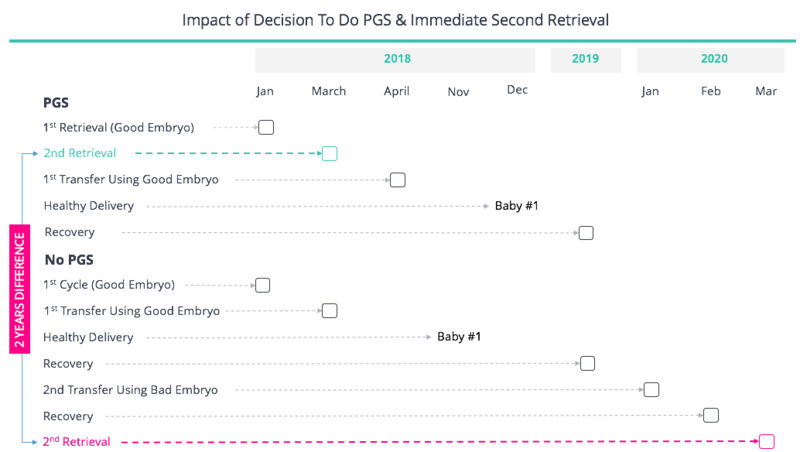 The family tests their extra embryos with PGS, realizes none of the extra embryos are likely to work, does another retrieval cycle in March, 2018. Thereafter, the family transfers a embryo and delivers its first child in December, 2018. Here this family stands with one baby and a new batch of March, 2018 embryos. The family decides to transfer their good embryo in March, 2018, the mother conceives and delivers in December, 2018. After a year of recovery, the family decides to transfer their next embryos in December, 2019. That transfer ends in a miscarriage (remember, those extra embryos were aneuploid) in January, 2020. After waiting two months to recover, the family begins their second retrieval in March 2020. Here this family stands with on baby and a new batch of March, 2020 embryos. Same family, same endpoint (one child already) but staring at the prospect of using embryos derived from eggs of a drastically different age: March, 2018 versus March, 2020. How much does two years matter? That depends on the woman but in many cases, it’s significant, as you can see by the SART success rates, by age, below. We will cover this more fully in a following lesson, but there is probably a credible case that PGS pays for itself. Often PGS costs the patient $5,000 and so that is the financial hurdle it’s benefit must provide. At a minimum, there is a reasonable case that PGS cuts down on the number of needless transfers ($3,000) with bad embryos and reduces the likelihood a patient pays to store embryos ($500 - $1,000 annually) that could prove non-viable. Maybe more compelling is that using PGS can illuminate if a patient has poor embryos, so they can start a subsequent retrieval cycle earlier, making that cycle more likely to work, thus reducing the need for additional cycles. After learning about PGS, it might seem like a no brainer – simply screen embryos, determine which have the highest rate of success and prioritize those, in the process conserving your time, money and emotional well-being. But, it’s not cut and dry, and PGS is one of the most hotly contested areas within fertility today. We’ll cover some of the more salient questions relating to PGS, namely concerns over mosaicism, for whom the test is most appropriate, return on investment, and more. What Is Mosaicism And Why Should I Care? Will your doctor tell you about mosaicism if you’re affected?